Going digital for the financial services industry has been regarded as a faster, safer, efficient and more convenient method of banking operations, enabling straight-through processing as well as the automation and digitisation of a number of repetitive, low-value, and low-risk processes. For a country like Philippines, which is still heavily reliant on cash transactions, the need to adopt digital payments to fully realise its endeavour of going cashless. The development of financial technology (fintech) and e-commerce in the country has paved the way towards digitalisation of payment transactions, with digital payments playing a positive role in improving consumer and merchant welfare by reducing inefficiencies and unlocking economic opportunities. However, it will still be a long journey, as 96% of transactions in the Philippines are still done in cash according to fintech Ayannah’s presentation during The Future of Finance, Philippines last October 2017. Mikko Perez, founder and chief executive officer of Ayannah, highlighted that “cash still remain king. The bulk of payments and remittances are still in cash.” The lack of infrastructure, a slow average internet connection speed of 5.5 mbps, and high cost of data in the country contribute to this relatively low statistic. Furthermore, 69% of the population still has no access to financial services, as per findings by the Bangko Sentral ng Pilipinas (BSP), especially due to large swathes of the population, primarily the middle and lower income groups, remaining unbanked, and the inequality between the rural and urban populations of the country, and further exacerbated by the lack of financial knowledge in the general population. Furthermore, BSP reported that banks continue to grow their branch network running counter to digitisation (Figure 1). This is evidenced by the relatively small, albeit growing number of E-Money accounts in the Philippines (Figure 2). Since 2016, the two top telco-powered mobile wallets, Globe Telecom’s GCash and Smart Communications’ PayMaya, have been making significant strides in educating and encouraging the use of digital payments in the Philippines. Both companies have introduced QR Code payments and integrated their payment services in the social media platform of Facebook Messenger. Digital payments may provide consumers with the tools to better manage their finances, particularly with one of the most challenging issues faced by consumers in the Philippines – bill payments. It may be seen that the consumers relying on cash-based payment methods that face difficulties in managing their bills and credit payments far outnumber consumers that use digital payment methods. The ability to choose one’s time and method of payment, as well as the ability to track payments can very useful in managing consumer cash flow and financial health. However, this trend has been slow in its uptake in the Philippines, impeded by the utilities and other government services being sluggish in pushing for digital connectivity for processing and otheroperations, and the reliance of the general population on cash for these purposes. In the Philippines, banks have established a payments management body in support of the efforts of the BSP to have a more accessible and competitive financial system, through the National Retail Payment System (NRPS). The NRPS framework, launched in December 2015, is the flagship program of the BSP in its efforts to modernise the country’s payment system, as it aims to create a safe, efficient and reliable retail payment system in the country. The NRPS is expected to help Filipinos access financial services and carry out financial transactions anytime and anywhere at a reasonable price through the use of innovative technology. It is positioned to aid the gradual transition of the Philippine financial industry from a cash-heavy to a cash-lite economy, benefiting various stakeholders by providing faster financial transaction processes and services in the Philippine market. Philippine Payments Management Inc. (PPMI) was registered with the Securities and Exchange Commission last August 30th to assist the BSP in implementing the NRPS. The PPMI would act as a supporting body of the BSP by monitoring the proper implementation and progress of the NRPS in achieving its end-goal of a more accessible and competitive financial system, through the digitisation of financial transactions. This newly organised body is the product of a mutual agreement, between the BSP and the Bankers Association of the Philippines (BAP) to create a shared clearing and settlements system for the Philippine financial system, hence indicating the Philippines’ desire to build an interconnected electronic retail payment system. Banks now have to start incorporating digitisation in their operations and how they interact with their customers. However, there is still much progress to be made, and many issues to combat along the way. In early 2017, the Union Bank of the Philippines (UnionBank) spearheaded the signing of a formal agreement to establish the Payment System Management Body (PSMB), consisting of representatives from 70 banks and e-money issuers, to pave the way for the creation of two automated clearing houses that will process batch fund transfers and real-time credit across bank accounts and e-money wallets. The PSMB is viewed as an important entity that will serve as a strong foundation for a modern digital retail payment system in the Philippines, and one of the clearing houses that will process electronic fund transfers by batches, to be called “PESO Net”. PSMB is also seen as the platform for big transactions and will serve as the alternative for checks. Moreover, the central bank aims to bring government transactions under the PESO Net, particularly for employee salaries, budget disbursements, and revenue collections. To ensure the timely capitalisation of the digital banking trend, UnionBank has been hiring “disruptors” and risk management experts to cultivate the disruption mind-set in its corporate culture, and anticipate potential disruptions from competitors. Another product by UnionBank is its “ePaycard”, a cashless and cost-efficient payroll or payment channel card that serves as both an automated teller machine card and a debit card. The UnionBank ePaycard allows customers to make purchases at all merchants and websites where Visa is accepted, immediately deducting funds from the connecting account, making it is a cashless and cost-efficient payroll/payment channel card. In terms of mobile apps, UnionBank rolled out the “EON” mobile app with electronic know-your-customer (e-KYC) features, which allow customers to activate their banking services without the need to visit a branch. The app, based on multi- platform technology, allows users to check account balances, transfer money, pay bills, and transact online through various devices. With four different types of accounts and features, the app caters to a range of customer requirements, such as the ability to transfer funds from PayPal or cash at convenience stores, thepreference of having no minimum balance requirement, as well as the ability of prequalified customers to apply instantly for loans through SMS or email. In its 2016 annual report, the bank stated that “digital transformation will continue to be our response to narrowing margins and increasing competition”, with plans put in place to “digitise the bank”, launch a “digital bank”, and “engage fintechs”. 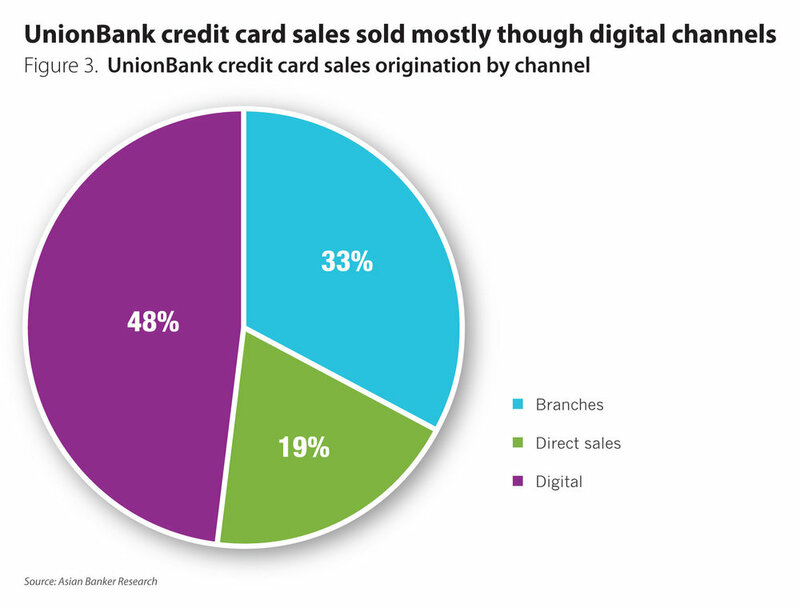 This shift is best seen through the sale of credit cards being mostly though digital channels at 48%, as opposed to other means, such as branch sales at only 38% (Figure 3). 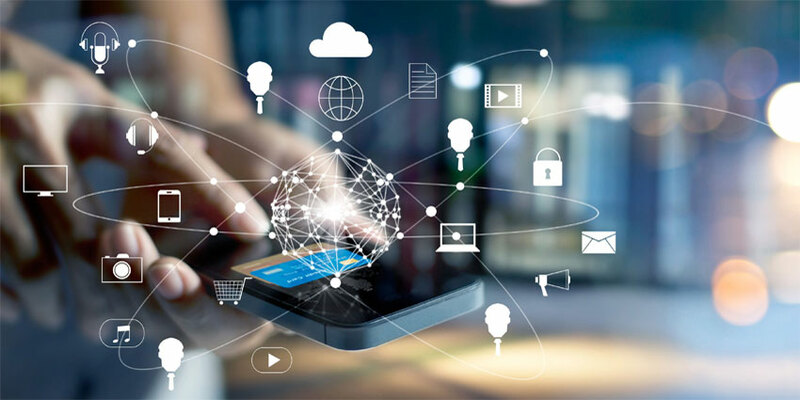 To better serve its customers, BDO included a peer-to-peer payment scheme in its mobile platform, which contributed 16% to all payments made through its mobile banking channel. The internet banking volume also grew 45%, while mobile banking transactions more than doubled during the first quarter of 2016. During the same period, the bank registered more than 500,000 active mobile banking users. As such, personal online banking revenue grew 23% as of December 2016, as there was a slow but increasing consumer preference for online banking. BDO’s retail internet banking functions well in many aspects, allowing its clients to sell their wares online. Users are able to sell their items online through BDO payment because of the ease at which customers are able to check if payment has been sent. This is especially so because sellers are able to verify in real time if their customers have deposited payments. Since 2004, Mynt has developed its mobile payments solution and wallet platform, “GCash”, to provide the underserved market with an alternative payment option and promote inclusive finance. Its offers load top-up, remittance, payments for good and services. As of September 2017, the fintech company has added more than two million users to its customer base in just a span of a year, of which 65,000 are monthly active users. Mynt has also been making strides in building a cashless ecosystem through strategic partnerships. To encourage the use of GCash, Mynth has partnered with various merchants to create more use cases for its customers. It also enhanced its products and services with the help of Alipay and Mambu. It has launched “GoPay”, the new feature within Globe’s GCash app allows customers to use their GCash account to pay for goods and services by simply scanning QR codes displayed by merchants and establishments. It also integrated its payment service on Facebook Messenger. Moreover, it recognised the lack of a national ID in the country thus is works with local government units and other companies in providing their community with an ID which doubles as a mobile wallet. Various trends are influencing the digitisation of the Philippine’s banking sector. First is the evolving demographic. Rising affluence in the country has led to a slow, but hastening decline in the number of individuals and households remaining unbanked. Nevertheless, there is a tremendous potential for growth as a large portion of the population remains unbanked, with the middle and lower income groups largely untapped. There is still a long way to go. BSP Financial Inclusion report showed that 87% of the population has no bank deposits, and of 43.2% who have savings, 68.3% keep them at home. Furthermore, of the 47.1% Filipinos who have loans, 72.3% borrowed from informal sources. Nevertheless, the major change in demographic as seen in the growth of millennials as the main consumer segment, comprising 62% of total internet users, serves as a huge opportunity for banks and non-banks to be more aggressive in pushing for digital payments in the market. Developments such as the rise of fintech, the implementation of the NRPS and the registration of PPMI are going to be instrumental in recommending policies to the BSP and other various agencies, as the Philippines moves slowly towards a more financially inclusive economic system, through cooperation and competition from various financial service providers. These developments also underscore the importance for banks to understand and address the needs of their customers to add value to their banking experience, as well as leverage on digital platforms and technology to give customers more reason to shift their payment behaviour from offline to online. Most importantly, the gradual transition of the Philippine financial industry from a cash-heavy to a cash-lite one will benefit all by providing faster financial transaction processes and services in the Philippine market. With several banks taking steps to capitalise on the trend of digitalisation and incorporate fintech in their operations, the future of digitalisation in the Philippines holds great potential for growth. This will require surpassing many deep-rooted issues before moving slowly towards a digitalised, cash-lite economy.